New Delhi, April 9 (IANS) In a first, a historic award function has been launched in order to recognise and honour die-hard fans of cricket at the 2019 ICC World Cup. 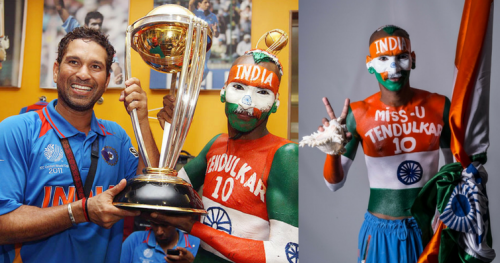 An initiative of Indian Sports Fan (ISF), the glittering ceremony will take place at the Eccles Town Hall in Manchester with Sachin Tendulkar's iconic fan Sudhir Kumar Gautam being the first recipient of the award along with four other fans. Expressing happiness on receiving first ever Global Sports Fan Awards, Sudhir said: "After 18 years, 319 ODI's, 66 Test,73 T20's, 68 IPL and three Ranji Trophy matches, I can confirm being a sports fan is solitary, arduous and yet a rewarding task. Gratified that I have inspired many on the path of fandom and Global Sports Fan Awards is a big recognition at global level. I dedicate this medal to my God, inspiration and my reason for my global recognition, Sir Sachin Tendulkar."